Most of these are from the LBJ library…. 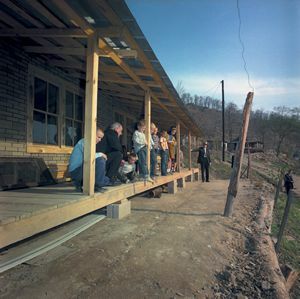 Johnson personally went to Appalachia; here he visits the Fletcher family in Inez Kentucky. The Fletcher family still lives in this home. Mrs. Johnson washes her hands before eating lunch with students at an elementary school. Note the lack of plumbing or running water. 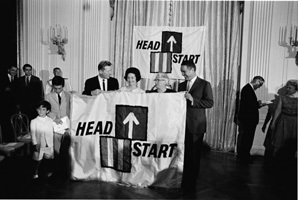 Another key component to fighting poverty was education, so Johnson initiated Project Head Start to provided federally funded preschool education to increase readiness for school among low-income children. 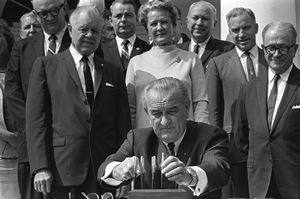 I am proud to sign the Food Stamp Act of 1964 because it is a realistic and responsible step toward the fuller and wiser use of our agricultural abundance. I believe the Food Stamp Act weds the best of the humanitarian instincts of the American people with the best of the free enterprise system. Instead of establishing a duplicate public system to distribute food surplus to the needy, this act permits us to use our highly efficient commercial food distribution system. It is one of many sensible and needed steps we have taken to apply the power of America’s new abundance to the task of building a better life for every American. 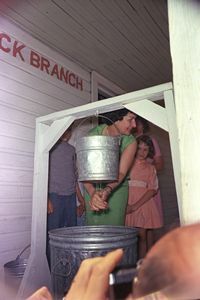 In 1961 President Kennedy’s first Executive order doubled the quantity and variety of foods to be distributed to the needy. Today nearly 6 million people enjoy a better share of our food abundance through this program and up to 15 different food items are now available. Likewise, this year we anticipate that 17 million children–3.2 million more than in 1960–will enjoy hot lunches in their schools, many of them for the first time. This is because of the sustained effort made to help our schools provide student lunches. For 3 years we have conducted pilot operations for the food stamp program in both urban and rural areas. These tests have exceeded our best expectations. They have raised the diets of low-income families substantially while strengthening markets for the farmer and immeasurably improving the volume of retail food sales. As a permanent program, the food stamp plan will be one of our most valuable weapons for the war on poverty. It will enable low income families to increase their food expenditures, using their own dollars. Our efforts to make better use of abundance are not limited to domestic programs. Hunger is a worldwide challenge. Through the Food for Peace program, we are sharing 7 percent more of our food with other peoples than in 1960. Our food abundance is being used constructively not only to combat hunger but also to help other nations to control inflation, generate funds for financing development projects, and to help provide lunches for some 40 million school children throughout the developing world. The support given the food stamp plan illustrates the willingness of thoughtful Americans to find better uses for our food abundance. I wish to compliment those who have played a role in the passage of this legislation, including the distinguished chairmen of the House and Senate Committees on Agriculture, Senator Ellender and Representative Cooley. 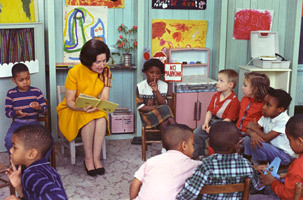 Special tribute is also due Congresswoman Sullivan and Senator Aiken, both of whom have long supported a Federal food stamp program effectively. Finally, I wish to convey my personal note of thanks to all agencies of State and local governments and to those bankers, food retailers, and wholesalers who have cooperated with the United States Department of Agriculture in this program during its 3-year pilot trial, and, finally, to the majority of the Members of the House and Senate who made it possible for this bill to be on my desk tonight.